Dell’s journey to transform itself from a hardware company to a solutions vendor has been ongoing for a couple of years. To achieve that, the company has been acquiring, building and blending hardware, software, services, cloud and open standards to broaden its technology footprint. But, much of Dell’s progress has been buried in the drama of the fight to take the company private. As the first major event since the company’s tumultuous–but ultimately successful–struggle to go private, Dell World 2013 promised to be somewhat of a bellwether. Would Dell, newly freed from Wall Street’s constraints, reframe itself as innovative, end-to-end solutions provider? Becoming an über-cloud provider: Except for its role as an arms supplier, the cloud has been a murky space for Dell. But at Dell World, it announced that Microsoft, CenturyLink, Dropbox and Google are on board with its expanded Dell Cloud Partner Program which is designed to give customers more choice and flexibility in the cloud, and to provide end-to-end support for offerings from multiple cloud vendors. For instance, customers gain the ability to manage single or multiple public, private and hybrid clouds through one pane of glass via Dell Cloud Manager (formerly Enstratius). Enabling customers to build open, private-cloud solutions based on Red Hat Enterprise Linux OpenStack Platform: Dell is the first OEM vendor to collaborate with Red Hat to provide businesses with co-engineered solutions and dedicated support and services for OpenStack. The goal is give businesses more confidence in using OpenStack as an alternative to proprietary IaaS and PaaS (infrastructure and platform as-a-service) alternatives. Consolidating channel and direct sales teams into one organization: To support its transition from hardware maker to solutions provider, Dell announced that it is combining direct sales and partner sales into a single organization–and providing a 20% “compensation accelerator” to motivate direct sales to work with channel partners on seven solution areas. Dell also announced expanded profit and coverage opportunities for partners, including turning over 200,000 named accounts to the channel. Innovating in industries: I knew that Dell is a top technology provider in the healthcare industry, much of this a result of its acquisition of Perot Systems. But didn’t know that it is the top IT provider in healthcare, and is helping pioneer change in this quickly evolving industry. For instance, Dell Services helped launched a state exchange for the Massachusetts Health Connector, and manages and secures Dell Cloud Clinical Archive, one of the largest (with nearly 7 billion images) cloud-based, vendor-neutral medical image archives in the world. At Dell World, te company announced a new cloud-based hospital administration system (HIS), which will launch first in India. Dell is also increasing its focus on other industries, including finance, where it has launched digital transformation frameworks and payment transformation services to help banks reduce costs, retain customers and improve compliance. In the insurance area, Dell has won more than 10 multi-million dollar contracts in the last eighteen months with its Third Party Administration platform. Going mobile. Sure, you know that Dell has mobile devices–from the new convertible (laptop to tablet) XPS 11 and Venue 11 Pro tablet to the newly released Dell Chromebook 11 (designed for the education market). But, building on prior solutions , Dell announced Enterprise Mobility Management, a unified mobile management solution to managed devices, apps, and content, and Secure Remote Access Gateway to protect endpoints, which will be available through the channel in 2014. I also learned that Dell Services offers custom mobile app development. Extending its investments in innovation: In his keynote, Michael Dell unveiled two new programs designed to foster innovation. First, Dell has created a research division to pursue organic innovation with a five to ten-year focus. Second, Dell has upped its investment in Dell Ventures with a $300 million dollar Strategic Innovation Venture Fund, a five-fold increase over its initial $60M investment. The Venture Fund invests in early to growth stage companies in the technology areas that Dell is focusing on–storage, cloud computing, big data, data center, security and mobility. Dell’s model is to co-invest with venture capitalists, serve as a board advisor, and provide product and go-to-market resources to the companies it invests in. Dell also reaffirmed its pledge to provide a broad range of entrepreneurs with technology, financing, networking and knowledge via the Dell Center for Entrepreneurs. It highlighted this focus with Dell Pitch Slam which attracted 6-8 late stage startups from several regional events to Dell World, where they pitched their ideas to Michael Dell and other judges. Check out the winners–Guavus, Neverware, and Fantoo. 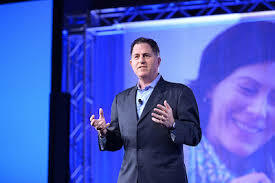 Maybe as important as the collective weight of all the announcements offered at Dell World 2013, Michael Dell deserves high praise for not only retaining so many employees, but for inspiring staff to stay the course through the trials and tribulations of the privatization process. As Dell stated in his keynote, “I feel I’m part of the world’s biggest start-up.” His attitude seemed to be contagious among employees, creating a sense of excitement that I hadn’t seen at the past two Dell World events. This renewed commitment and energy from within is the essential first step to a successful transformation, and getting customers and the broader market to view Dell in a new light as well. Disclaimer: I attended Dell World as an invited media guest. Laurie, I’m very impressed by the welcomed introduction of a Dell Chromebook. I can only imagine how difficult it was for them to reach past their very close relationship with Microsoft — particularly now they’re a significant investor in Dell’s future direction. Thanks Laurie your post is amazing to read.